People use brainstorming (either intentionally or serendipitously) for generating ideas and coming up with creative solutions to problems. Teaching third graders the art of brainstorming and allowing opportunity to practice enables them to be more open to possibilities, allows for quirky ideas and also increases the richness of possibilities explored. We believe that all children have potential for creativity and can be taught strategies to enable them to practice this skill. Keeping with our objective to promote a growth mindset, we decided to continue our Design Workshop with an activity to make the students more aware that brainstorming and creativity are important and accessible skills. We decided to link our lesson to International Dot Day. We framed the idea of courage and creativity by reading “The Dot”. When the story was done, we asked the students to turn and talk with a partner about what they thought the author’s message was. The children were able to identify several such as believe in yourself, everyone can be creative, anything is possible, etc. Next we shared a blank page with 30 circles. We asked the children to think of some possibilities for what they could create out of the circles. After a brief share with partners, we had a whole group conversation about circle possibilities. Before they went off to independently capture their brainstorming of ideas for the circles, we stressed the importance of being open to any idea that pops into their head - without judgement! We were interested having the children break down the walls that often block them or make them hesitate. We settled with the number 30 since we felt that it was attainable yet asked the students to stretch for quantity. We set a timer at five minutes to give the children a sense of urgency with generating ideas and ask them to be quick in their sketches. The children completed the activity solo and silently. Since an important step of creation is seeking and incorporating feedback, we decided to complete a gallery walk. This gallery walk feedback was a little different than our typical “KIND, SPECIFIC, USEFUL” feedback in that it was only kind and specific. We gave each student stickers and asked them to silently review the sketches. When students found a circle that they liked, they could give feedback by putting a sticker next to it. Again, we used a timer and asked the children to work silently. Next we asked the students to decide to either incorporate feedback by choosing their most stickered dot or to choose their personal favorite and make a prototype. While seeking feedback is an important skill, choosing how to use feedback is critical to moving forward in the design process. After they had chosen their best dot, they were given limited materials to make their prototype. They each used one paper plate, markers, crayon, colored paper, tape, scissors and glue to create their vision. Finally, we asked the students to make their thinking about creativity visible. 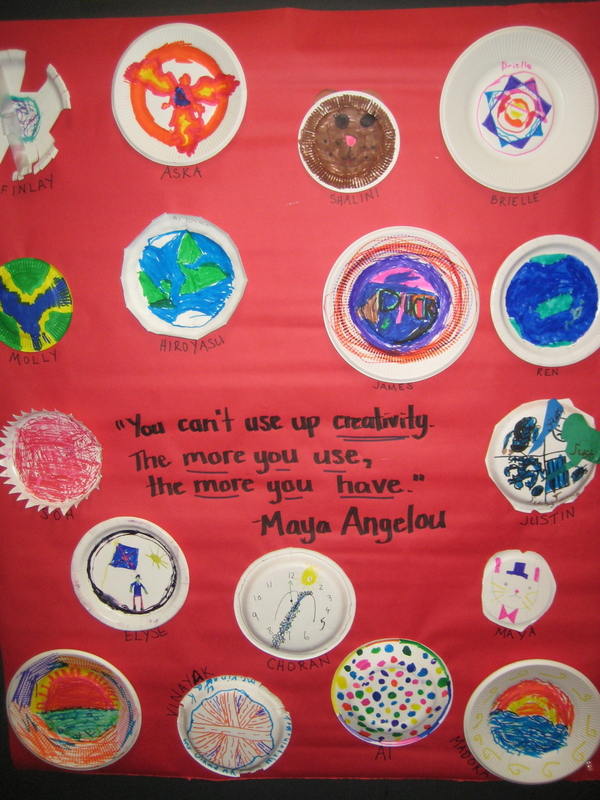 We shared a quote from Maya Angelou, “You can’t use up creativity. The more you use, the more you have.” We asked each student to jot down their thoughts about creativity. Dig a little deeper into their thinking about creativity. It may have been the placement in the lesson or the earliness in the school year, but their thinking wasn’t as rich as we had anticipated. We may have assumed too deep an experience base in this type of thinking. We could also possibly do a gallery walk and then give more time to work independently. Another option could be to put them in small groups to build on of the idea of group brainstorming. If we had more time we might have gone for multiple dot prototypes and had the students in small collaborative teams creatively design a way to frame their dots or hang them together.